Murder on the Orient Express is a mystery drama film directed by Kenneth Branagh, based on the 1934 novel of the same name by Agatha Christie. The film stars Branagh, Penelope Cruz, Willem Dafoe, Judi Dench, Johnny Depp, Josh Gad, Derek Jacobi, Leslie Odom Jr., Michelle Pfeiffer and Daisy Ridley. While traveling on the Orient Express, an American businessman is murdered in the middle of the night. Belgian detective Hercule Poirot (Branagh) is then commissioned to find out which one of the train's passengers committed the murder. This is the typical murder mystery story that you have seen before so to talk about the plot too much would give it away. This plot has been done before in a classic film from 1974 (check out the review here) and if anyone has not seen that film, it should definitely be watched. Remaking a murder mystery is inherently tough as the resolution is already out there so Branagh's task was already difficult going into this production.Having director Branagh to take the helm was a very good choice by the studios as he has done many successful remakes of older films such as Henry V, Much Ado About Nothing, Mary Shelley's Frankenstein, Cinderella, and Hamlet. He is smart enough to know that he is not going to trick anyone with the story's reveal but rather he is going to bring together an ensemble cast and tell an entertaining story. Branagh is good as Poirot, more on that later, but his choices as a director are great. Some of this film's biggest strengths are its technical aspects. This look of this film is absolutely beautiful from the costumes to the landscapes to the Poirot's mustache. Due to some great production design and cinematography, Branagh is able to bring you into this 1930's world. As the majority of this film takes place on a few train cars, it can be difficult to keep an audience interested for 114 minutes. However, due to the imagery that Branagh is able to provide the audience, it is a fun story to be invested in. As with the prior film, this film has a stacked cast. Depp is the American businessman, Mr. Ratchett, Pfeiffer as the loud and annoying Mrs. Hubbard, Cruz as Pilar Estravados, Dench as Princess Dragomiroff, Jacobi and Gad as Rachett's butler and secretary, Odom as Dr. Arbuthnot, and Ridley as Mary Debenham. 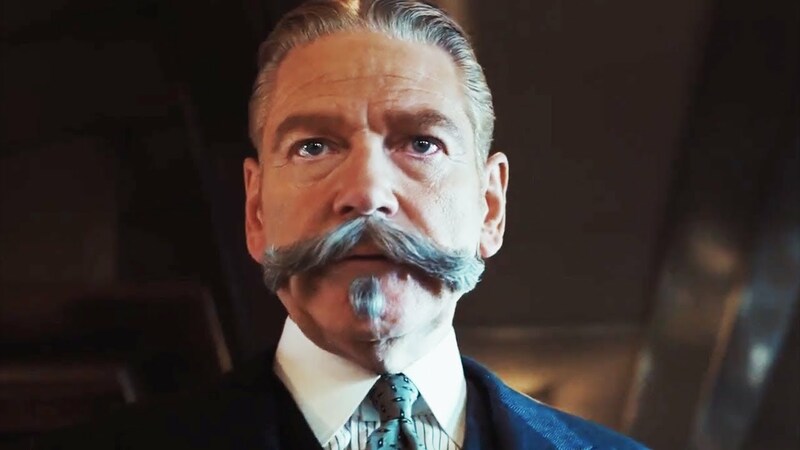 They all do very well in their respective roles however the standout is Branagh as Poirot. While everyone seems to be having fun in this film, Branagh left the most fun to himself. His Poirot is both theatrical and hilarious in ways that did not exist as much in the Finney version. Branagh is able to bring layers to his character that shows how both his quirks and also his heroic qualities. He wants justice and that's what drives him to be one of the world's best detectives. As the story plays out, you able to see his brain working hard to find out who killed the person and bring them to justice. Branagh is an absolute pleasure to see in this role and it is perhaps one of his best performances. He is able to carry this film on his mustache and definitely validates another film just to see him as this character once again. Out of the supporting characters, the standouts were Pfeiffer, Odom, Ridley, and Gad. With the material they were given, they were able to pull out good performances. Like the original, this film has many characters and it can be hard to introduce characters and make the audience care about them. Unlike the original, these ones seemed uninteresting. Not to say they were bad however the characters seemed were only likable because of who was playing them. It was similar to someone dressing up with their friends and having fun while doing that. This film also focuses more on Poirot than any of the other characters which as said above gives a great performance from Branagh. However, some stars such as Dench and Cruz feel underused. The film is a fun journey up to the final act which feels a tad unsatisfying because of the lack of focus on the other characters. Also, the film seemed to set up the reveal a little more with small moments and made it seem less surprising. With a murder mystery movie, the film needs to be able to give clues that do not give away the ending too much which unfortunately takes a lot of away from the film. However, that last point may be due to prior knowledge of the reveal and could be different to someone who did not know it. For the first two-thirds of the film, this film is a lot of fun. You have a great cast with the standout of Branagh and some phenomenal production. Unfortunately, the film's final act prevents this film from being as good as the prior rendition or as good as it could have been. It had a lot of potentials but felt a little underwhelming. However, Branagh does make this film worth watching in both the direction and acting fronts. The cast is great and is a lot of fun to watch on screen. You don't have to watch this good but enjoyable film in theatres but its definitely worth checking out on Bluray or VOD.